A lasting decrease in the near-surface wind speed (SWS) in China has been revealed, but a following short-term strengthening in the SWS was rarely noted. 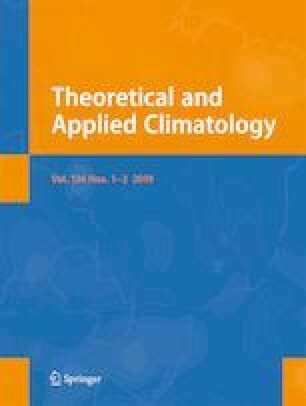 In this paper, the daily mean SWS observed datasets from 328 measurement stations in Eastern China during the period 1981–2011 were used to investigate the facts and causes of the observed short-term strengthening in winter SWS in recent decades. The major results are summarized as follows: the SWS showed a significant decrease in the last 30 years, but a short-term strengthening in SWS was observed during the winter since 2000 in Eastern China. The SWS in Eastern China showed a significant decrease of − 0.11 m s−1 decade−1 from 1981 to 1999, followed by a weak increase of 0.0008 m s−1 decade−1 from 2000 to 2011. The short-term strengthening in the SWS since 2000 was mainly induced by the changes of the pressure-gradient force (PGF), which could be attributed to the changes of the sea-level pressure (SLP) in the region (51°–69.75° N, 51.75°–111.75° E). Furthermore, the changes of the PGF during the two periods of 1981–1999 and 2000–2011 were consistent with those of the SLP in the region (51°–69.75° N, 51.75°–111.75° E). The correlation coefficient between PGF and SLP was 0.32 and 0.66 during the period 1981–1999 and 2000–2011, respectively. Therefore, the effects of the changes in SLP over the region (51°–69.75° N, 51.75°–111.75° E) on changes of SWS in the Eastern China should be significant. The authors cordially thank the reviewers for their thorough comments and constructive suggestions, which improve the paper quality significantly. Daily meteorological data is available from the China Meteorological Data Sharing Service System, and the ERA-Interim dataset comes from the ECMWF. We thank all the dataset providers. This study was sponsored by the Chinese Natural Science Foundation (41675149, 41775087), the National Key Research and Development Program of China (2016YFA0600403), and the Yunnan Province Education Department Project (2017YJS106). The paper was also supported by the Program for Key Laboratory in University of Yunnan Province, the Chinese Jiangsu Collaborative Innovation Center for Climate Change, and the Young Scholar of Distinction for Doctoral Candidate of Yunnan Province in 2016.